Saturday, May 2nd is Free Comic Book Day, the biggest day of the year for comics retailers. Comic book stores all over North America will be giving away dozens of select titles for free and will host in-store signings, costume contests, and more. There are 50 titles made just for Free Comic Book Day, and here are 10 that I think are worth getting to your local comic book store early to nab. The first three books on this list are previews of some of the most anticipated comics of the year, but the one with perhaps the widest appeal is Chuck Palahniuk’s comic book sequel to his 1996 novel Fight Club. To give us a taste of what to expect with Fight Club 2 (which comes out May 27th), Palahniuk and artist Cameron Stewart have adapted the final scene of the original Fight Club (which is different from the ending to the 1999 film of the same name) for this FCBD special. In addition, this issue features a Goon story by Eric Powell and a new chapter of Guillermo Del Toro’s vampire series The Strain. If Fight Club doesn’t reach back far enough to scratch that nostalgic itch of yours, Marvel is bringing back the event book that begat all event books: Secret Wars. Whereas the original 1984 series was a pretty light read about heroes and villains fighting it out in a place called Battleworld, this one promises more of a modern sense of epic catastrophe that only writer Jonathan Hickman can bring. The premise is something Hickman has been building towards during his run on Avengers and New Avengers, and it will supposedly give us “the final days of the Marvel Universe as you know it.” This 0 issue sets the stage for the 8-issue limited series launching in May. Meanwhile, DC is currently in the middle of its own universe-shaking event series, Convergence. Divergence is a FCBD special that previews the post-Convergence future with three eight-page snippets from these upcoming comics: Batman, Justice League, and Superman, which shows DC’s potential new creator-driven focus by debuting Gene Luen Yang, the book’s new, award-winning writer. Archie Comics continues to surprise us. After a year in which we’ve seen Archie killed off, Riverdale overrun with zombies, and Sabrina the Teenage Witch marrying Cthulu, they are now reviving an old imprint of superhero comics called Red Circle and rebranding it as Dark Circle. This FCBD offering contains previews of their three flagship titles: The Fox, The Shield, and Black Hood. These are edgy and contemporary takes on some old, little-known characters, revitalized by top-notch creators like Mark Waid, Dean Haspiel, Michael Gaydos, and more. There are a lot of good free comics for younger readers to choose from, including Transformers, Pokemon, and The Simpsons. SpongeBob Freestyle Funnies features new stories by some familiar names in cartooning like Graham Annable (director of the animated film The Boxtrolls and creator of the comic Grickle), James Kochalka, Maris Wicks, and more. With Avengers: Age of Ultron hitting theaters this week, it’s only natural that there's an Avengers comic in the FCBD mix. 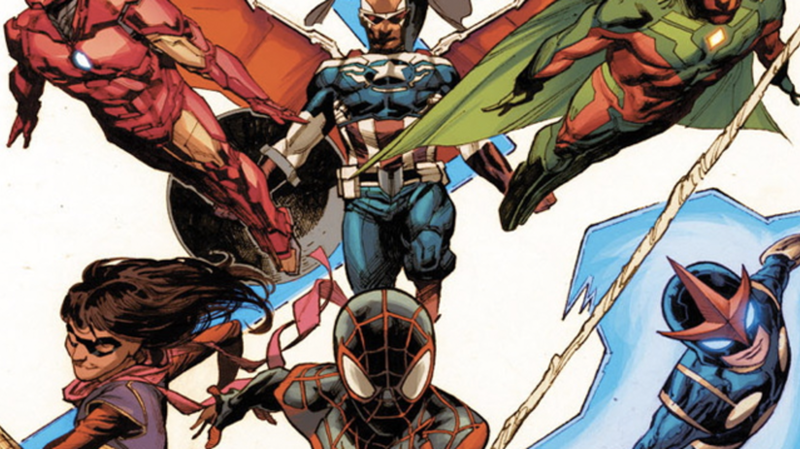 However, this is “The All-New, All-Different Avengers,” which looks nothing the cinematic version of the team. This lineup comes about after the events of Secret Wars and showcases some of the diverse changes Marvel has made to their A-list heroes. There’s the new African-American Captain America, the female Thor, the Muslim-American Ms. Marvel, and the black-hispanic Spider-man. With a third volume of Ed Piskor’s history of hip hop music, Hip Hop Family Tree, coming soon, Fantagraphics has put excerpts from all three volumes in their FCBD collection. It also contains Piskor’s adaptation of the Spike Lee-directed Levi’s commercial starring comic book artist Rob Liefeld, drawn in a pretty accurate mimicry of Liefeld’s recognizable style. The second half of the comic contains an all-new story in Dash Shaw’s Cosplayers series. Dynamite’s new Bob’s Burgers comic book series is notable in that it is written and drawn by the TV show’s writers and animators. It has been a big hit with fans of the show, and this FCBD issue contains a “greatest hits” collection of short stories that have appeared in the series so far. Prolific comic book writer Cullen Bunn, known primarily for his pulpy horror/action comics like The Sixth Gun, is launching a new all-ages series for Oni Press called Terrible Lizard. We’ve seen a lot of "boy and his dinosaur" stories in the past, but this one focuses on a girl and her dinosaur, which is actually a refreshingly different take. Mike Maihack’s second volume in his all-ages graphic novel Cleopatra in Space just hit stores this spring. It’s the latest series from Scholastic Books’ comic book line, which already boasts bookstore classics like Bone, Smile, and Amulet. Cleopatra in Space is like Harry Potter, but with a teenage Egyptian Cleopatra in the far future going to a school taught by cats. The FCBD issue features an excerpt from the first book. This is just the beginning. Head over to the Free Comic Book Day website to see what other titles will be available and to get other details about the day’s events.